Country Boy Albert Lee gives us the full monty in this masterclass – the whole circus act, in fact… AIbert Lee and Hogan’s Heroes (Gerry Hogan on pedal-steel guitar, Pete Baron on drums, Brian Hodgson on bass and Pete Wingfield on keyboards) recorded a special masterclass including a backing track. It took ages to figure out positions for certain licks (Albert shifts fretting hand position at a frightening rate, and even if you see him live it’s still difficult to follow by eye) so figuring out how the sounds heard match up with where his hands are generally involves a reasonable amount of speculation. The format is simple enough: an 8-bar vamp for an intro where Albert plays double-stops and, although we’ll come across a lot of hybrid picking later on, here I think it’s just simple plectrum stabs. After that it’s just straight ahead: three 32-bar sections – call it AAA if you will – plus a slightly jazzy outro including a couple of repeats and final ‘bosh’. 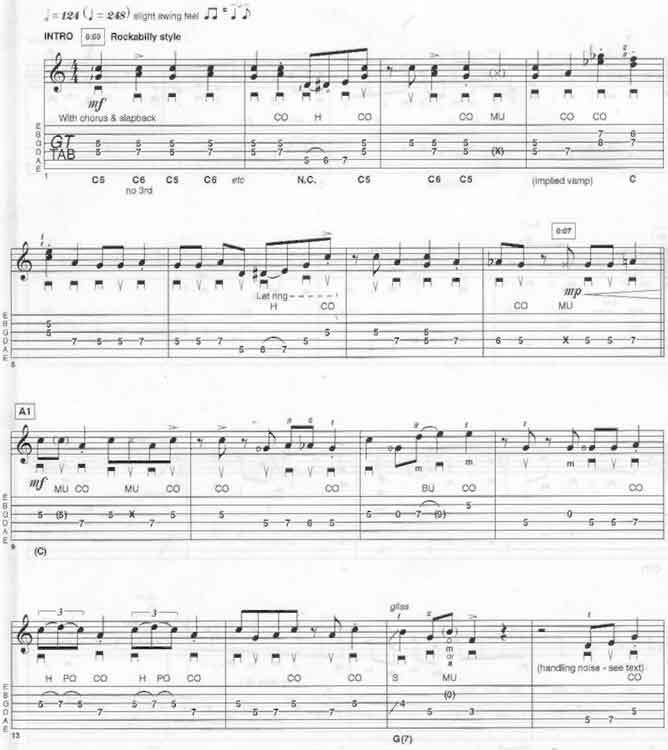 Bar 12 is the first sight of one of Albert’s trademark licks: two identical pitches (a unison) played on adjacent strings – one is typically an open string. Bar 16 is frankly a bit messy. There’s some handling noise before Albert rhythmically strikes the strings to maintain good timekeeping and a steady flow – is that such a bad thing? Incidentally, careful listening to what Albert actually plays in ‘cliff-hanger moments’ reveals an inconceivable level of proficiency – Albert’s ability to weave and dodge his way around and escape tricky situations is truly mind boggling! In bar 20, Albert places a partial barre across a trio of strings, most typically the 4th-2nd strings, and it’s a kind of pivoting or ‘rubber-stamping’ motion that’s needed (here the notes mustn’t bleed into each other). Look out for it elsewhere… By the way, Albert sometimes starts playing a run which will fit the impending chord, yet it doesn’t seem quite appropriate for the then-current chord. But top players – Larry Carlton springs to mind -adopt this kind of approach; by anticipating the upcoming chord it makes the music sound all the more settled when everything resolves, falling into place nicely. It needn’t be ‘outside’ playing… Just check out how Albert employs the C blues scale in bar 38 and in the outro too – it works, doesn’t it? Bar 25 incorporates a simple, but interesting, idea: using an open string instead of a fretted one as part of a line or melody. Bar 32 seems like Albert was fishing around but there’s nothing offensive. The lesson here is not to panic – target a good note and stay cool! Bar 40 contains a typically straightforward run. Find it in another guise coming out of bar 45 and a permutation thereof in bar 71, plus a transposition halfway through bar 95. Next, the A section is about to repeat and Albert adopts a slightly more bluesy approach at first. Bar 41 sounds rather brassy, especially with those cut-off stabs, which are emphasised by being played off the beat (syncopated) for a while. Bars 43/44 comprise a Lydian b7 modal idea, which you could think of as being Mixolydian #11 as well. To temper that jazzy stuff, in bar 46 Albert quite naturally drifts into the simple C major scale and retains the pattern while it transforms into the G Mixolydian mode (the notes of which originate from C major). I’m sure the last note of bar 48 is an open string, so bar 49 could possibly be played on the 4th and 3rd strings around the 7th position, but I believe it to be as per my TAB indications. Bar 50 should be dealt with accordingly. Crucially, bar 51’s Country Boy reference confirmed to me that Albert was indeed in open position and had to have been thereabouts immediately prior to that -I kind of worked backwards through my transcription for a few bars to piece it all together. Think about it… Bar 57 is another trademark lick: a double-stop with two single notes, typically the 5th and b7th, sometimes the 6th scale step, serving to create a loop of sorts – an ostinato figure in classical speak. Here, I think Albert used an open G sting as the 5th, but I guess he did that only because it fits the C chord (he would normally finger a partial barre). In bar 71, and elsewhere, you’ll catch Albert using triplets which, especially at high speed, really grabs one’s attention! Incidentally, Brent Mason also likes playing sextuplets (two successive triplets, effectively) as an occasional rhythmic feature. Think: “b’diddly-diddly”, etc. Coming out of bar 80 there’s evidence of Albert’s rockier leanings: unison bends going along the neck -Carlos Santana would do such moves using an aggressive pick attack and with distortion, but Albert’s clean tone and snappier attack keep it distinctively ‘Albert’, if you know what I mean. By the way, as I write this I find it interesting that Albert seems to be starting sections and sub-sections with blues phrases of sorts. I couldn’t say whether he’s doing that deliberately or consciously, it’s just an observation. Bar 92 involves a speedy position shift, the sort of tiling which you don’t realise how difficult it is to perform with ease – the true mark of a master at work. Heading into bar 95 you’d be forgiven for thinking that the rhythm slips a bit, but check out what I perceive the idea to be and you might be shocked by Albert’s deftness. I’m not saying he thought of fitting in nine notes here, but the line he played is remarkable for how it got him out of a tricky situation. No amount of practice can prepare you for that sort of thing; you need to be thrown in at the deep end and go for it, as such. Bar 97 made me chuckle somewhat! I thought I knew most of Albert’s subtle moves, but here he’s reinventing a trademark lick, or at least that’s my perception of it. To explain: Albert typically plays (groups of) triplets that include an open string and usually involving relatively simple scale-based ideas, but here the accompaniment starts on F, so the open B string acts as the flattened 5th or sharp 11th – quite jazzy, wouldn’t you say? He keeps the momentum going by merely repeating the motif against the next two chords, F# diminished and then C – it all works, doesn’t it? Bar 107 introduces 6ths – country guitar teachers often go on about them but here, as you can see, Albert uses them as a throw-away and not a feature. To add to the casual nature of the ending, Albert stays with some fairly basic Chuck Berry-style rock’n’roll ideas before a final cliche – fearlessness has been the name of the game from start to finish! Albert Lee remains right at the top of his profession, yet I for one occasionally lake his playing a bit for granted. Get your guitar out though, play along to the backing track (after learning as much of the transcription as you dare) and see if you can play as well as Albert does. Be driven and inspired to play better, that’s what I say. It’s a part of Albert Lee Lesson – Why Not? © 2012 - 2019 TabsClub Powered by TabsClub 42 queries in 0.607 seconds.